I love taking long hikes, but they sometimes make my legs sore at the end of the day. 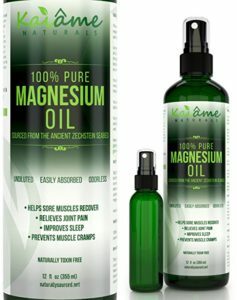 Until I discovered that one of the best natural remedies for leg cramps, body aches, and sore muscles is magnesium oil spray. Seriously, a couple of spritzes of this natural healing oil not only relieves muscle tension, but also helps me sleep better and relax in the evening. What I like about it: This is one of the purest magnesium oil products in the market. The oil is made using 6 stages of purification and reverse osmosis technology in a testing facility that is government certified. It is 100% natural and sourced from one of the best therapeutic locations for this mineral on earth – the Dead Sea. I love giving myself up to 5 sprays per leg each day. You can even apply it with coconut oil for maximum comfort. This product can be pricey, but the large 8 oz. bottle can last up to 6 months depending on your usage. Plus, Magnum Solace gives 100% refund if you’re not satisfied with the results – no questions asked! An Amazon reviewer even mentions that it helps combat the negative effects of her stressful career plus it does not burn like other magnesium oil sprays. Why not give this one a try to see for yourself? What I like about it: This magnesium oil is sourced from the ancient Zechstein Seabed in Netherlands – one of the purest in the world. This product is pure and undiluted, unlike 90% of the brands in the market today. A slight sting from this product is normal and will eventually subside, but you can also dilute it with water to create a 50-50 solution for a milder spray and more value for your money. According to reviews, this product helped relieve pain from injury and even fibromyalgia. This comes in a small 4 oz. bottle, so it can be more expensive than the oil from Magnum Solace but it comes with an informative e-book valued at $9.99. ASUTRA also provides a 100% money-back guarantee. Check it out! What I like about it: This magnesium oil spray comes in a large 12 oz. giving you more value for your money. 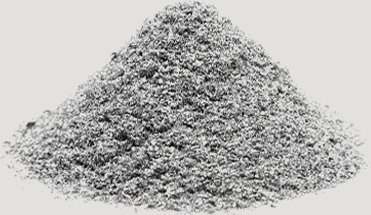 It is 100% pure and organic, and sourced from deep down in the Zechstein Seabed. Because it is sourced from two miles beneath the surface, it is guaranteed free of impurities and tested free of lead, arsenic, fluoride and mercury. If you are a new user, it is best to lower your dosage and gradually increase. Dilute this product 1:1 with water to begin. The company even includes a free travel spray bottle for this. Try this product for yourself to reap the health benefits of magnesium oil. What I like about it: If you are just starting out with magnesium oil sprays, this is a good one to try. Although it is advertised as a natural deodorant, this product can also be used for stress relief and natural muscle pain remedy. It’s the best price per ounce for a natural product. It is also paraben- and cruelty-free! Great for first-time users. 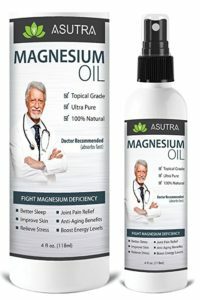 Magnum Solace, ASUTRA, Kaiame and ArtNaturals are some of the best magnesium oil brands that I can recommend. They make pure and natural products that are good for your health. And you can purchase all of these products on Amazon. Want to learn why magnesium oil sprays are good for you? Check out our article on magnesium oil benefits!